Sewage treatment plants in areas affected by Superstorm Sandy continue to release untreated or partially treated sewage, and in many places the flow is expected to continue into waterways at least through November. The combination of untreated sewage in the water and prolonged power outages has the attention of local and state officials and environmentalists because of the potential health consequences. Reports of sewage discharges are numerous across the affected areas. We’re reprinting here a comprehensive report from Long Island Newsday, originally published November 11, 2012. This excellent article gives an idea of the scope and seriousness of the problem. 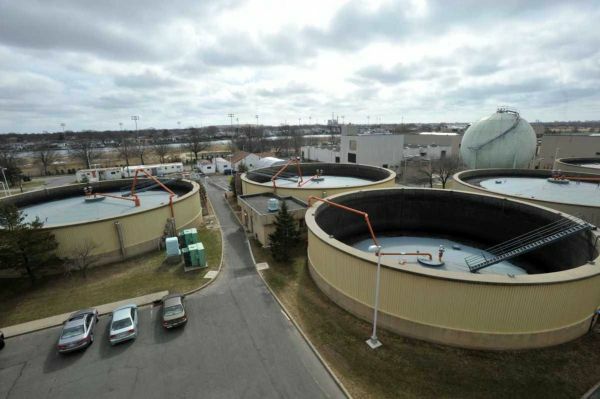 Sixty-five million gallons of partially treated sewage from a plant that serves almost 40 percent of Nassau‘s residents are flushing each day into a waterway north of Long Beach — the result of damage from superstorm Sandy that could have far-reaching environmental implications. Initial estimates from Nassau County said the sewage flow from the Bay Park Sewage Treatment Plant into Reynolds Channel could go on through about Nov. 30 as workers try to fix the plant. Now, Department of Public Works spokesman Michael Martino says it is “undetermined” when the East Rockaway plant can resume fully treating sewage. The treatment pumps failed when the plant was flooded by a 9-foot wall of water pushed ashore by Sandy. The daily volume amounts to 1.95 billion gallons of sewer water a month that has been cleared of solids and chlorinated — but not fully treated — pouring into the channel, which flows into Rockaway Inlet and the Atlantic Ocean. It’s enough material to fill about 2,954 Olympic-sized swimming pools. It could be six to 12 months before the facility is fully repaired, according to a statement from the office of Nassau County Executive Edward Mangano. County officials confirmed the sewage flow amounts but declined to comment about the extent of its potential impact. And Sandy didn’t just cause sewage problems. Churned-up debris, gasoline, home heating oil and hazardous materials also poured into roads and waterways. At the moment, however, the sewage issue is being eclipsed by efforts to recover from the devastation of Sandy and the nor’easter that followed. Still, the combination of untreated sewage in the water and prolonged power outages has the attention of local and state officials and environmentalists because of the potential health consequences. The state Department of Health is working with health care providers to track illnesses that may be Sandy-related, such as diarrhea, carbon monoxide poisoning and respiratory issues, said Peter Constantakes, the agency spokesman. No major outbreaks have been reported. Nitrogen from septic tanks getting into waterways could also produce more harmful algal blooms like the kinds that shut shellfishing beds last summer, said Chris Clapp, a marine scientist with The Nature Conservancy of Long Island. “If anything, this catastrophe has really shed a bright light on . . . the need for more modernized and updated ways of treating our wastewater materials,” Clapp said. Bay Park stopped operating at 10 p.m. Oct. 29 when the facility flooded during the storm. Ruptures in system pipes also sent sewage into streets and homes in Baldwin, East Rockaway and elsewhere, clogging homes with a mix of sewage and floodwater, making them unfit for habitation. A relief system that drains the sewage but doesn’t treat it went online at 3 p.m. Oct. 31, two days after Sandy and operated for 48 hours, sending 34 million gallons of raw waste water into Reynolds Channel, Macy Channel, Mill River and Parsonage Creek, Martino said. On Nov. 1, the plant began partially treating sewage again and is processing 65 million gallons of water daily. “It’s absolutely a bad solution, but it’s the only solution right now,” Kopel said. The only other option, he said, would be to have the sewage back up into homes and streets. What’s being pushed into Reynolds Channel doesn’t leave immediately, said R. Lawrence Swanson, director of the Waste Reduction and Management Institute at Stony Brook’s School of Marine and Atmospheric Sciences. Swanson, who studies Bay Park, said it takes about 200 hours for fully treated sewage to dissipate into the ocean. Long Beach — inundated with seawater and deep sand, and left without functioning power, sewer or water systems — borders the channel. “That whole area becomes more vulnerable and more susceptible to public health threats,” Esposito said. The water and sewer systems are operating, but on a limited basis. Built in 1949 and last refurbished in 1996, the Bay Park plant has been plagued by years of neglect and inadequate funding. In June 2011, the county and state Department of Environmental Conservation settled a lawsuit after the agency said Nassau failed to maintain equipment and report illegal discharges. Nassau agreed to pay a $500,000 fine and spend another $500,000 to study the feasibility of building a pipe to transport treated wastewater to the ocean. Since taking office in 2010, Mangano has committed more than $70 million toward updating the plant. The environmental implications of Sandy stem from, among other things, the enormous storm surge that swept up so much debris. Cars picked up by the surge leaked oil and gas; heating tanks ruptured and spilled into basements or were carried outside, septic systems were compromised and household items drifted into streets. The exact amount of sewage released around Long Island is not known, nor is a figure available for gas, oil and other debris swept away. But the amount of spills — from hazardous waste to petroleum — reported to the DEC from Nassau and Suffolk counties is more than three times what was reported during 2011’s Tropical Storm Irene. The cases account for 51 percent of Sandy spill reports in New York, according to a DEC spill database. From Oct. 29 to Nov. 4, Nassau and Suffolk homes and businesses reported 862 spills. For the same length of time during Irene, 229 spills were reported. Petroleum spills of more than 5 gallons that are not cleaned up within two hours must be reported to the state. The rules for reporting hazardous waste vary based on circumstance, according to the DEC. The Sandy spill reports came from sewage treatment plants, yacht clubs, marinas, homes, transformers, pump stations, hospitals and manholes from Island Park to Quogue. DEC spokeswoman Lisa King said the spill calls are coming in daily and the agency is prioritizing cleanup response.